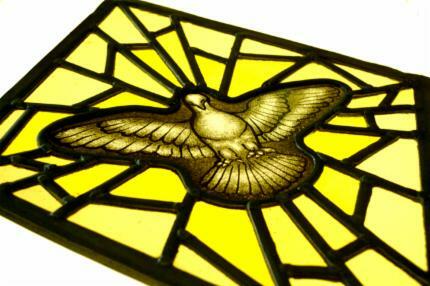 Stained glass dove for the top light in a church window. Scotland. 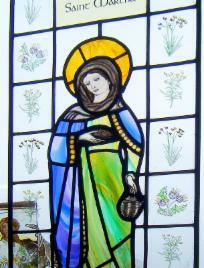 A new stained glass window depicting "Our Lady of Knock" for Our Lady and St. Ninian church, Bannockburn, Scotland. The Blessed Virgin Mary was described as being very beautiful, standing a few feet above the ground. She wore a white cloak, hanging in full folds and fastened at the neck. The crown appeared brilliant, and of a golden brightness, of a deeper hue, than the striking whiteness of the robe she wore; the upper parts of the crown appeared to be a series of sparkles, or glittering crosses. Our Lady of Knock.(Left). Knock Shrine (Irish: Scrín Chnoc Mhuire) is a major Catholic pilgrimage site in the village of Knock, County Mayo, Ireland where it is claimed there was an apparition of the Blessed Virgin Mary. 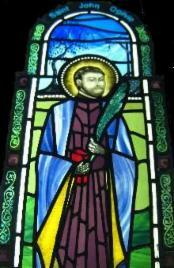 St.John Ogilvie (middle). Saint Martha (right). 2010,2011,2013. 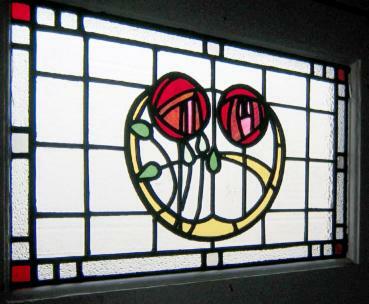 A simplified Charles Rennie Mackintosh design used for this transom light in a Glasgow home. 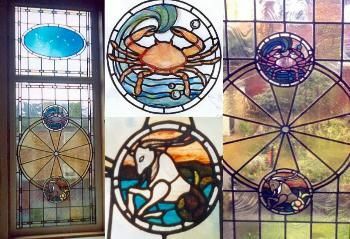 Zodiac Stained Glass. Capricorn and Cancer. Private commission. 2003. Above the zodiac symbols for Cancer and Capricorn the window has their corresponding constellations etched into blue flashed glass. (Flashed glass is a clear/white glass with a thin layer of colour poured over it.This technique was developed in Medieval times to produce red glass. Etching the coloured layer reveals the white glass beneath). The glass in the crab is a Hartley Wood pink. Swirl. Stained glass panel. Private commission.Swirl. Stained glass panel. Private commission. The picture shows the cartoon (The traditional term for the drawing of the window/panel.This is used as a template to cut the glass), the construction (the numbered glass pieces laid out over the cartoon prior to leading up) and the installation of the panel.The following picture shows the cartoon (The traditional term for the drawing of the window/panel.This is used as a template to cut the glass), the construction (the numbered glass pieces laid out over the cartoon prior to leading up) and the installation of the panel. 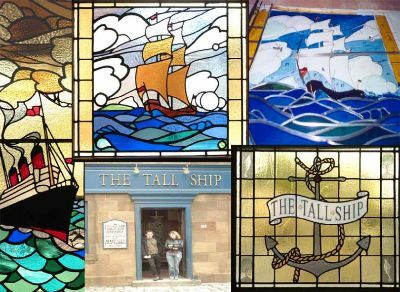 The above panels show 3 of 12 stained glass panels made for the "Tall Ship Inn" featured on the BBC TV drama "River City".